Comparative studies of ancient and modern policy, strategy, diplomacy, and imperialism seem to be all the rage at the moment, with most of the impetus coming from scholars of ancient societies rather than from those concerned with the modern world. The recent edited volume under review by well-known Classicist and conservative political commentator Victor Davis Hanson pays homage to two pathbreaking studies with similar titles, and has a clear and unapologetic presentist editorial agenda: “to consider the relevance of [ancient] strategy to later warfare, and especially to the conflicts of our times” (4). Mark L. Haas is, along with his mentor John M. Owen, part of a two-man wrecking crew exposing the ideological foundations of international politics. 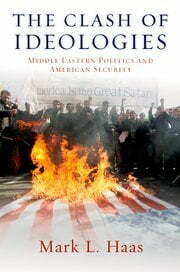 His latest effort, The Clash of Ideologies: Middle Eastern Politics and American Security, expands on previous work Haas and Owen have done on “ideological distance” and applies these ideas to three decades of international politics in the Middle East. In so doing, Haas has written a book that is theoretically innovative, scientifically progressive, empirically wide-ranging, and policy relevant. Anyone who wants to understand the interplay of ideological and realist variables or the intricate politics of a region central to American foreign policy needs to read this book.